Mouse House, Inc. will have its doors open for two artistic events during the months of April. Susan has recently transformed one of the downstairs back rooms into her new home studio. She has been creating 3-D mixed-media pieces which will be shown during the Columbia Open Studios event on April 21 and 22. Susan was honored to have her piece, "Time", featured on the cover of the March and April 2012 issue of Jasper Magazine. She will be here on Saturday April 21 from 10AM to 4PM and all day (12PM-6PM) on Sunday. More information about this event will be posted later. April 21 also corresponds to the annual Elmwood Park Tour of Homes. Since we were already participating in the Open Studios event, we offered our house as an additional venue that people could tour during their event. It is a win-win situation for Susan and The Mouse House because of the additional traffic generated by the Home Tour. We will also encourage anyone specifically coming to see Susan and The Mouse House to visit the other historic homes that will be open to the public during the tour. Additional information will also be posted later. Linda, LoraDell,Susan, Wanda, and Erica at Liberty Island, 1965 (digital photograph of a slide, see post below). Click to enlarge. The head mouse, Susan, is spending the whole month of March at The Studios of Key West as one of their artist-in-residence. Today she is teaching her famously "Hot" class to 12 eager students (a class that had 8-10 people on a waiting list). She is spending this month creating faux stain glass fiber pieces and more InBox pieces for an upcoming show in Fredericksburg, VA in June. Needless to say she is having a great time away from me and the business. I will join her on March 29 and we will return on April 2. 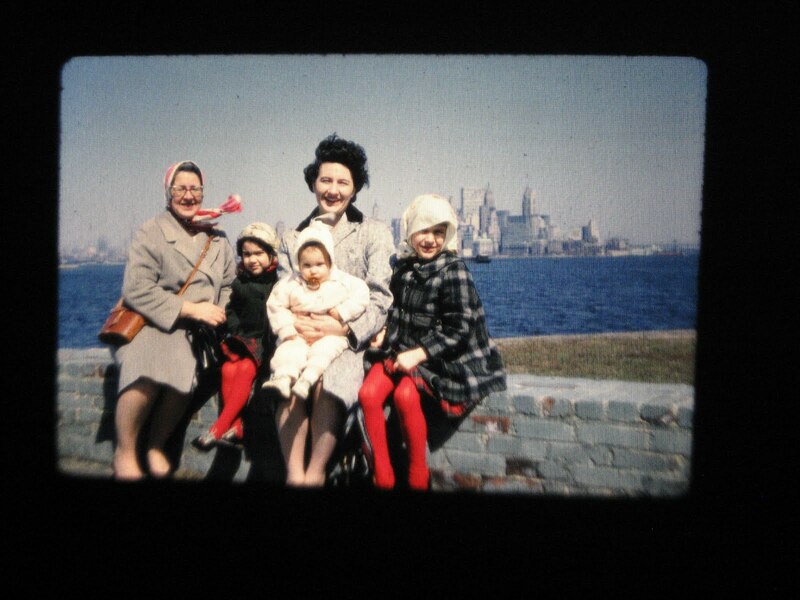 One of my duties ( it is actually my pleasure and honor) in her absence is to record and document the hundreds of photographic slides that Susan's grandfather, Connell Baker, created during the years from 1954-1971. I never had the pleasure to meet him because of his untimely death in 1978. The slides contain photographs of his trips (with the love of his life, LoraDell, still alive and kicking at 93) all over the United States and Europe, family photos of his children, grandchildren, immediate family members and friends, and everything else in between. 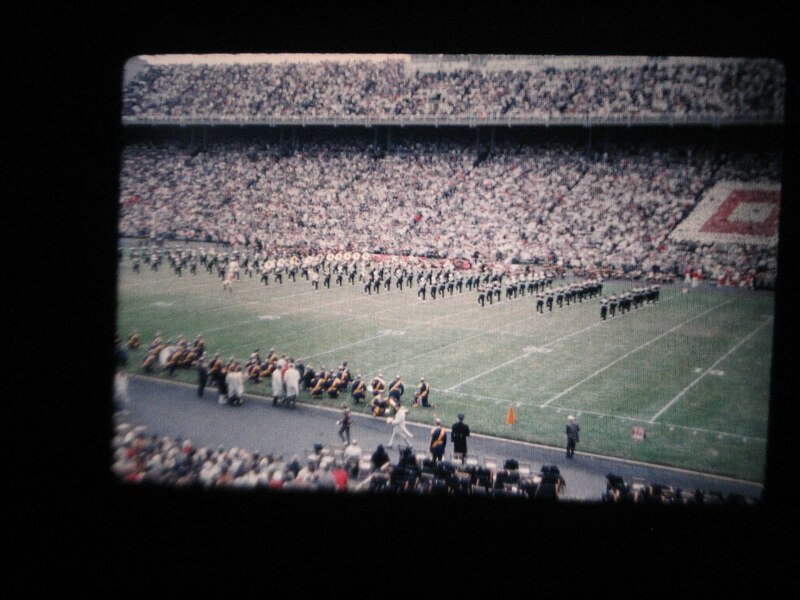 He even took slides of President Lyndon Johnson's Inauguration in 1965. There are no fewer than 95 boxes of slides with 36 slides per box. Every slide was named and dated, and each one was enclosed in a metal case. The metal slides were placed in a Airequipt automatic slide magazine and viewed using a Argus 300 Slide Projector. This was cutting edge technology before the invention of the Carousel projector that most people of my generation would remember. The vast majority of the slides are in incredibly good shape with crisp colors and clarity. Many have not been seen in 50 years or more, and many of them have never been seen by Susan's family. Before Susan left for Florida, she set up a tripod with my digital camera and movie screen borrowed from her sister, Sonya, in our living room upstairs. 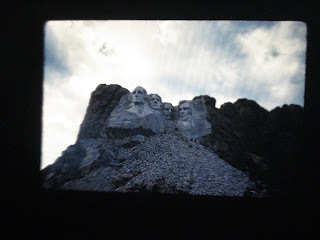 We set up the Argus Projector, and I began taking digital photos of each slide as projected on the movie screen. Each container and slide is named using Connell's descriptions and stored on the computer. Although the quality is not as good as the slide itself, one can get a reasonable idea of which ones may need to be scanned for better reproduction (and believe me, there are many that warrant this!). I have finished the first suitcase of 45 boxes and will begin work on the next 50 later today. I plan on finishing the shooting of the slides before Susan returns from Florida. Below are a couple of photographic reproductions of slides from the Baker Slide Collection. Block O around the 20 yard line. The score was 21-0 (final score was 44-0). These seats were far better than the Block O section that Susan and I fondly remember! View of Mount Rushmore, South Dakota, September, 1961.